The jury of the 2013 Arctic Award awarded Sebastian a gold medal on behalf of the Photographic Society of America (PSA). The Arctic Award specializes in Polar photography. This is Sebastian’s second win: in 2012, the FIAP (Federation International de l’Art Photographic) had awarded him a medal for the same competition. 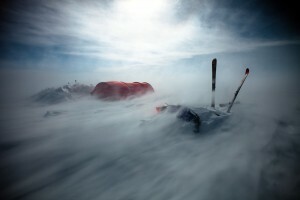 The winning image below depicts a storm on the Greenland ice cap, with winds reaching 80 miles per hour, during Sebastian and Eric’s record setting south to north crossing on skis and kites.